Recognised by Golf Digest as "Best New Course" in 1996 Remington provides a striking and comtemporary design with abundant water features and scenic landscaping. A fair but challenging golfing experience. Designed by Clifton, Ezell & Clifton Golf Design Group. The course at Remington has been designed to offer an enjoyable experience whilst providing a fair test of skills from every tee. 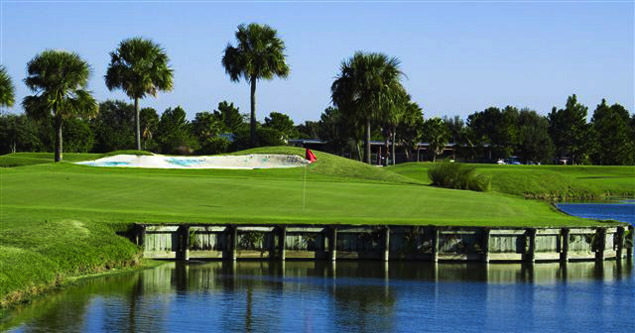 As with Kissimmee Bay Country Club, Remington's sister course just 1 mile up the road the "All You Can" deal offers exceptional value where you can replay without charge at both Kissimmee Bay and Remington, enjoy breakfast, hot dog and soda at the turn and unlimited practice balls in a unique Water Driving Range. Friendly staff, a well stocked Pro shop, 2 great and very affordable courses next to each other, unique water practice range and amazing deals makes Remington and Kissimmee Bay Country Club a must do on your vacation.